Maxi Electro Rope. 6mm dia. x 200m. 6x0.4mm stainless steel conductors for better conductivity and strength. 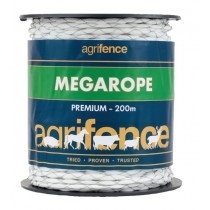 For long lengths of permanent or temporary paddock fencing.